.... has been funded, initially, from donations in memory of Kathleen Savage who was herself a recipient of a shawl (pictured on the front of the attached leaflet - please see the link HERE) during the final stages of her illness. It was a very meaningful gesture made by a similar ministry at First United Methodist Church, Conway, Arkansas USA. · offering a home for a meeting of a knitting/crochet group. Any level of skill is acceptable. Help and advice are available from the Team Pastors who hold supplies of patterns and wools. There is also much information on the internet to give new ideas. 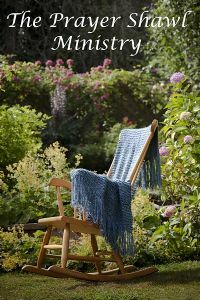 Our first Prayer Shawl was donated in October 2010 to a church member who was moving away from the Haywards Heath area. Since then we have donated over 160 items including:shawls, scarves (the scarves are given to men), shawls for Baptisms, knee blankets, ponchos' capes, baptism shawls, baby shawls to the Special Care Baby Unit at the Princess Royal Hospital. 14 shawls and 3 scarves abroad. The shawls have been donated to the recipients for various reasons such as illness, bereavement and for comfort during difficult personal times. A few have also been donated to people in need of something cosy to wrap around during the winter months. Over 34 people in our church and friends have been involved in the making of the shawls and scarves. As well as donating the shawls and scarves, the coordinators of the Ministry have had many national requests for information about patterns and how we began this Ministry. Over the centuries, shawls have come to symbolise shelter, peace, and spiritual sustenance. The Prayer Shawl Ministry began in 1998 in Hartford, Connecticut, USA, and many churches across the world have now begun similar Ministries of their own. Members and friends of these churches have lovingly donated their time and talents by creating knitted and crocheted shawls for those in need. The first shawls were knitted for women undergoing treatment for cancer. Some were also made for new mothers. Many other situations calling for comfort and care are now responded to, with the gift of shawls, blankets or wraps to both women and men. What started as a grass-roots ministry has quickly grown into an international cause.